Red Cardell, one of the most famous bands from Brittany, (the peninsula of Celtic identity in north-western France), is essentially a live band. 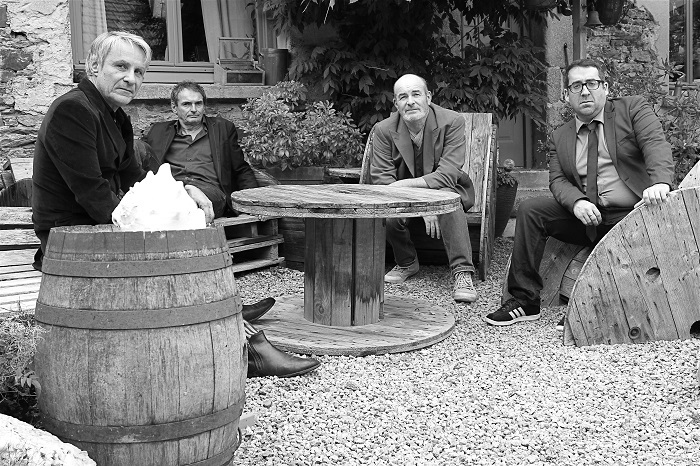 Formed in Quimper in 1992, since then has recorded sixteen albums including five live and played at nearly two thousand concerts all over Europe and North America, including famous stages in France such as: Vieilles Charrues Festival, Eurockéennes, Les Francofolies de La Rochelle, Printemps de Bourges, Festival Interceltique de Lorient, Le Zénith Nantes Métropole and Paris-Bercy Arena. They also played in Ukraine, Finland, Germany, Belgium, Luxembourg, Switzerland, Czech Republic, Slovakia, Spain, Italy, Cyprus, West Indies, United States and Canada. Unclassifiable, their music is mainly a mix of Breton music and also of Slavic, Latin or berber music with blues, rock, folk, punk and French realistic song and even more recently cheered up with electro and hip hop elements. The lyrics are inspired by the style of writing of poets and authors like Jacques Brel, Léo Ferré, Boris Vian or Jacques Prévert. It is these rich influences that follows the specific Jean-Pierre Riou poetic, turned to melancholy. They define themselves as a popular music band open to the world. Besides their collaboration with French artists ( Yann Tiersen, Christophe Miossec, Dan ar Braz, Thomas Fersen…) African and Ukrainian musicians, they also have performed with British or American musicians, either on records or live. These artists include: Jimme O’Neill (The Silencers), Dr Das(Asian Dub Foundation), Dave Pegg (Fairport Convention, Jethro Tull), Tanya Morgan, Juan Sebastian Larobina and Winston McAnuff. The also worked in 2016 with Emmelene Landon Australian Painter and Writer.